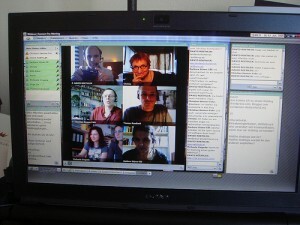 23 Things #3: Online Meetings | ed. tech. for. me. Photo courtesy David Röthler via Flickr. Used under Creative Commons 2.0. Back in October, I attended a webinar hosted by Tech & Learning Magazine about “Ensuring Safety, Security, and Success with Mobile Learning,” and you can read my Quick Review post covering that webinar here at this site. I began taking advantage of webinars back in about 2004 when I was still a licensed teacher and needed some additional options for professional development activities that fit my schedule. They were fairly rare back then, especially in the world of education. Since then, I have attended several virtual conferences for school and work and find them to be very convenient, as the author of today’s 23 Things indicated. To participate in this 23 Things activity, I initially decided to watch the archived webinar entitled “Digital Storytelling: Everyone has a story to tell” that was hosted at Infopeople.com. By the time I was going through the activity, BCR.org had closed down and SirsiDynix had only a couple of recent webinars in their archives. Unfortunately, the WebEx technology was not cooperating very well with me, so I decided to watch an archived webinar hosted at Tech & Learning called “Web 2.0 in Schools.” I got the most benefit out of the first 25-30 minutes of the presentation where several educators/tech facilitators gave several examples of different web-based technologies and how they were being used in their schools. Some of the topics mentioned were Facebook and Twitter, Google Docs, Diigo, Wikia Novelas, and several others. They also included videos during the live presentation, but those were not visible in the archived version (though they did include links to additional videos). The second half of the video was basically an instructional “commercial” for CoolHub.IMSA (not an actual URL). This part was so uninteresting that I did not even make it through the entire segment, I’m shamed to admit. The entire webinar was sponsored by K-12 Computing Blueprint, a project sponsored by Intel and organized by Tech & Learning Magazine. That site has a wealth of information regarding establishing 1:1 computing projects at your schools, which I have bookmarked for future reference. In general, these webinars are indeed very convenient and have the potential to be very helpful. Some of the virtual conferences, however, run the risk of being “overly” sponsored to the point that it seems like one big giant commercial. Finding privately organized webinars or online meetings created for a very specific group of people for a very specific reason would likely be a much more beneficial endeavor. I know that many manufacturers and designers have people on staff who are more than willing to set up private meetings for things like that, especially if you show interest in investing in their product. Wow, using webinars in 2004!?! I didn’t even know they existed until this past fall! I didn’t even think about the fact that they could be heavily-sponsored, and that is a fair warning for us all.